Until now, very little about the recent history of the Mapuche, Chile’s largest indigenous group, has been available to English-language readers. Courage Tastes of Blood helps to rectify this situation. It tells the story of one Mapuche community—Nicolás Ailío, located in the south of the country—across the entire twentieth century, from its founding in the resettlement process that followed the military defeat of the Mapuche by the Chilean state at the end of the nineteenth century. Florencia E. Mallon places oral histories gathered from community members over an extended period of time in the 1990s in dialogue with one another and with her research in national and regional archives. Taking seriously the often quite divergent subjectivities and political visions of the community’s members, Mallon presents an innovative historical narrative, one that reflects a mutual collaboration between herself and the residents of Nicolás Ailío. Mallon recounts the land usurpation Nicolás Ailío endured in the first decades of the twentieth century and the community’s ongoing struggle for restitution. Facing extreme poverty and inspired by the agrarian mobilizations of the 1960s, some community members participated in the agrarian reform under the government of socialist president Salvador Allende. With the military coup of 1973, they suffered repression and desperate impoverishment. Out of this turbulent period the Mapuche revitalization movement was born. What began as an effort to protest the privatization of community lands under the military dictatorship evolved into a broad movement for cultural and political recognition that continues to the present day. 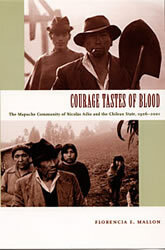 By providing the historical and local context for the emergence of the Mapuche revitalization movement, Courage Tastes of Blood offers a distinctive perspective on the evolution of Chilean democracy and its rupture with the military coup of 1973.